Create the distinctive sandwiches you have been craving or cook bacon just to your liking. The Bacon Panini Press is a handy tool for any chef. Simply rest the press on the cooking surface to warm it, then place it on top of the food to cook from both sides at once. Your bacon will be finished in a fraction of the time, and your sandwiches will look like they've come straight off of Pinterest with perfect sear lines. Add this press to your cast iron collection today. Cast Iron Bacon and Panini Press Create the distinctive sandwiches you have been craving or cook bacon just to your liking. The Bacon Panini Press is a handy tool for any chef. Simply rest the press on the cooking surface to warm it, then place it on top of the food to cook from both sides at once. Your bacon will be finished in a fraction of the time, and your sandwiches will look like they've come straight off of Pinterest with perfect sear lines. 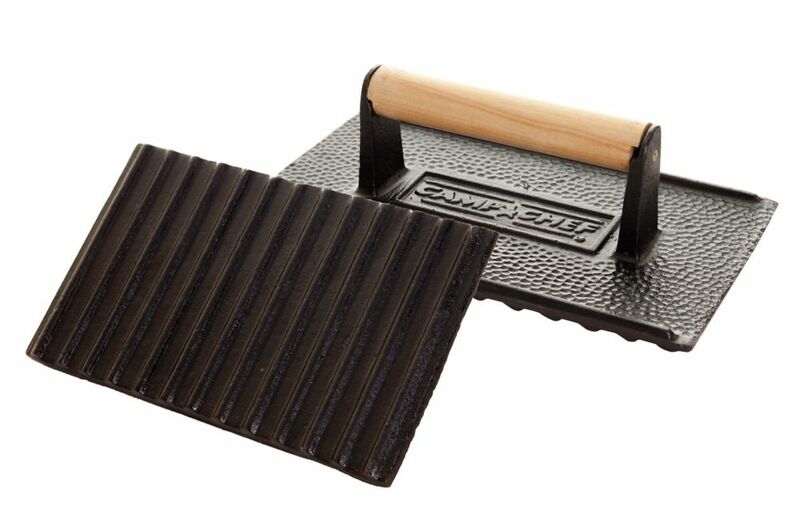 Add this press to your cast iron collection today. Cast Iron Bacon and Panini Press is rated 5.0 out of 5 by 4.